OMEGA Savi-Socket® Collar Remover. Hi-Lok® Collar Remover, Hi-Lite® Collar Remover. OMEGA Starter Set contains 6 Savi-Socket®sfor 75-85% of the Hi-Lok® collars typically encountered in routine aircraft maintenance, including the most frequently encountered collars. OMEGA 6 piece Savi-Socket® set. Removes all Dash 10 and 12 Hi-Lok®and Hi-Lite® Collars. (Sizes 5/16'' and 3/8'' diameter collars) Set contains Savi-Socket® Sizes: 43, 47, 50, 51, 55, and 56. OMEGA 4 piece Savi-Socket® set is specifically designed to remove Eddie-Bolt® Fastener Collars. This four socket set will cover all -5, -6, -8, and -10 Eddie-Bolt® collars. OMEGA Savi-Socket® Collar Remover with .21'' socket opening and 1/4'' square drive. Eddie-Bolt® Collar Remover, Hi-Lok® collar Remover, Hi-Lite® Collar Remover. Removes 5/32'' Eddie-Bolt® Collars. Replaces part number RS100-EB5. OMEGA Savi-Socket® Collar Remover w/ .21'' socket opening and 3/8'' female square drive. Eddie-Bolt® Collar Remover, Hi-Lok® collar Remover, Hi-Lite® Collar Remover. Removes 5/32'' Eddie-Bolt® Collars. Replaces part number RS100-EB5. OMEGA Savi-Socket® Collar Remover with .24'' socket opening and 1/4'' square drive. Eddie-Bolt® Collar Remover, Hi-Lok® collar Remover, Hi-Lite® Collar Remover. Removes 3/16'' Eddie-Bolt® Collars. Replaces part number RS100-EB6. OMEGA Savi-Socket® Collar Remover w/ .24'' socket opening and 3/8'' female square drive. Eddie-Bolt® Collar Remover, Hi-Lok® collar Remover, Hi-Lite® Collar Remover. 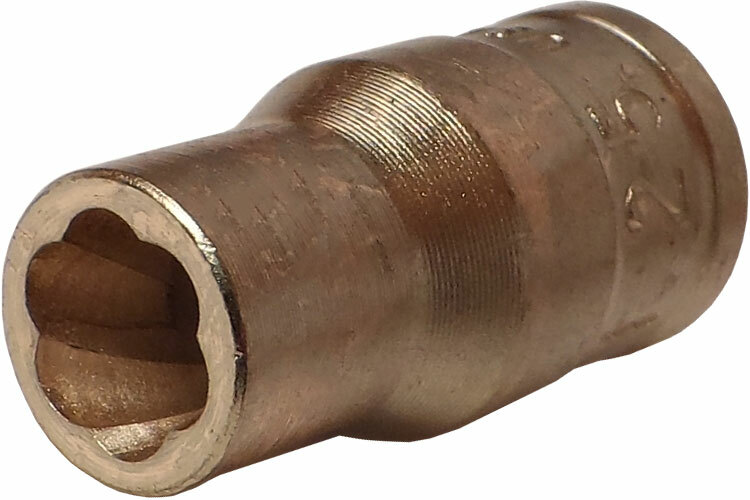 Removes 3/16'' Eddie-Bolt® Collars. Replaces part number RS100-EB6. OMEGA Savi-Socket® Collar Remover with .25'' socket opening and 1/4'' square drive. Hi-Lok® collar Remover, Hi-Lite® Collar Remover. OMEGA Savi-Socket® Collar Remover w/ .25'' socket opening and 3/8'' female square drive. Hi-Lok® collar Remover, Hi-Lite® Collar Remover. OMEGA Savi-Socket® Collar Remover w/ .26'' socket opening and 1/4'' female square drive. Hi-Lok® collar Remover, Hi-Lite® Collar Remover. Perfect for BACC30BL5 and BACC30BP6 collars. OMEGA Savi-Socket® Collar Remover w/ .26'' socket opening and 3/8'' female square drive. Hi-Lok® collar Remover, Hi-Lite® Collar Remover. Perfect for BACC30BL5 and BACC30BP6 collars. OMEGA Savi-Socket® Collar Remover w/ .27'' socket opening and 1/4'' female square drive. Hi-Lok® collar Remover, Hi-Lite® Collar Remover. Perfect for BACC30BL6 collars. OMEGA Savi-Socket® Collar Remover w/ .27'' socket opening and 3/8'' female square drive. Hi-Lok® collar Remover, Hi-Lite® Collar Remover. Perfect for BACC30BL6 collars. OMEGA Savi-Socket® Collar Remover w/ .28'' socket opening and 1/4'' female square drive. Hi-Lok® collar Remover, Hi-Lite® Collar Remover. Perfect for BACC30BH6 collars. OMEGA Savi-Socket® Collar Remover w/ .28'' socket opening and 3/8'' female square drive. Hi-Lok® collar Remover, Hi-Lite® Collar Remover. Perfect for BACC30BH6 collars. OMEGA Savi-Socket® Collar Remover w/ .29'' socket opening and 1/4'' female square drive. Hi-Lok® collar Remover, Hi-Lite® Collar Remover. OMEGA Savi-Socket® Collar Remover w/ .29'' socket opening and 3/8'' female square drive. Hi-Lok® collar Remover, Hi-Lite® Collar Remover. OMEGA Savi-Socket® Collar Remover with .32'' socket opening and 1/4'' square drive. Eddie-Bolt® Collar Remover, Hi-Lok® collar Remover, Hi-Lite® Collar Remover. Removes 5/32'' Eddie-Bolt® Collars. Replaces part number RS100-EB8. OMEGA Savi-Socket® Collar Remover w/ .32'' socket opening and 3/8'' female square drive. Eddie-Bolt® Collar Remover, Hi-Lok® collar Remover, Hi-Lite® Collar Remover. Removes 5/32'' Eddie-Bolt® Collars. Replaces part number RS100-EB8. OMEGA Savi-Socket® Collar Remover with .33'' socket opening and 1/4'' square drive. Hi-Lok® collar Remover, Hi-Lite® Collar Remover. Perfect for BACC30BP8 Collars. OMEGA Savi-Socket® Collar Remover w/ .33'' socket opening and 3/8'' female square drive. Hi-Lok® collar Remover, Hi-Lite® Collar Remover. Perfect for BACC30BP8 Collars. OMEGA Savi-Socket® Collar Remover with .34'' socket opening and 1/4'' square drive. Hi-Lok® collar Remover, Hi-Lite® Collar Remover. Perfect for BACC30BL8 collars. OMEGA Savi-Socket® Collar Remover w/ .34'' socket opening and 3/8'' female square drive. Hi-Lok® collar Remover, Hi-Lite® Collar Remover. Perfect for BACC30BL8 collars. OMEGA Savi-Socket® Collar Remover with .35'' socket opening and 1/4'' square drive. Hi-Lok® collar Remover, Hi-Lite® Collar Remover. Perfect for BACC30BH8 Collars. OMEGA Savi-Socket® Collar Remover w/ .35'' socket opening and 3/8'' female square drive. Hi-Lok® collar Remover, Hi-Lite® Collar Remover. Perfect for BACC30BH8 Collars. OMEGA Savi-Socket® Collar Remover with .36'' socket opening and 1/4'' square drive. Hi-Lok® collar Remover, Hi-Lite® Collar Remover. OMEGA Savi-Socket® Collar Remover w/ .36'' socket opening and 3/8'' female square drive. Hi-Lok® collar Remover, Hi-Lite® Collar Remover. OMEGA Savi-Socket® Collar Remover with .37'' socket opening and 1/4'' square drive. Hi-Lok® collar Remover, Hi-Lite® Collar Remover. OMEGA Savi-Socket® Collar Remover w/ .37'' socket opening and 3/8'' female square drive. Hi-Lok® collar Remover, Hi-Lite® Collar Remover. The OMEGA SAVI-25 #25 Savi-Socket For Hi-Lok And Hi-Lite is one of thousands of quality tooling products available from MRO Tools. Please browse Savi-Socket Hi-Lok Removers for tools similar to the OMEGA SAVI-25 #25 Savi-Socket For Hi-Lok And Hi-Lite. OMEGA SAVI-25 #25 Savi-Socket For Hi-Lok And Hi-Lite description summary: OMEGA Savi-Socket® Collar Remover with .25'' socket opening and 1/4'' square drive. Hi-Lok® collar Remover, Hi-Lite® Collar Remover. Quantity discounts may be available for the OMEGA SAVI-25 #25 Savi-Socket For Hi-Lok And Hi-Lite. Please contact MRO Tools for details.